The flat season really started to hit gear in the last 10 days with the first major 3 year old trials for the 2000 and 1000 Guineas in early May. Still very early for many hands to be played in this but while it is an acknowledged trial for the Guineas it was interesting that Luca Cumani chose this race for the reappearance of Postponed. Everything about his pedigree and his running style as a raw 2yo last year suggested that a 10 furlong minimum trip was what he needed and yet he was backed for this 1 mile race. Not surprisingly he got outpaced after a slow early pace quickened up but he was staying on powerfully in the final furlong. Dubawi’s stock tend to progress well with racing and I think we can expect to see some significant improvement when he faces a trip. Despite being a maiden the cast list of winners in last 10 years bears witness that trainers send some decent types to this event. Dancing Rain (2011) and Eswarah (2005) both went on to win the Epsom Classic. 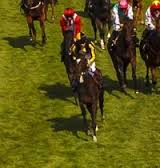 Other winners – Vow, Gertrude Bell and Clowance all finished 4th at Epsom – the latter two also tasting subsequent Group level success. Folk Opera (2007) went on to record a Group 1 victory, while Pink Symphony also progressed to Group 3 glory in 2010. This leads us onto the winners of the two divisions this year – Bright Approach and Inchila. The former was part of a golden weekend of winners for John Gosden and still looked quite green – there doesn’t seem to be much gossip that Epsom is her destination as yet and could see her swerving that race so she is passed by for now. Inchila, on the other hand is of much greater interest. She won her maiden easily, coasting in behind the leaders in the straight and then settling matters with a swift turn of foot. The win was all the more impressive after the way she pulled so fiercely early on in the back straight. With a run behind her and hopefully a stronger pace, she could be seen in a better light still and there would appear to be plenty of untapped potential here.